Ah, it’s the trailer for the Hunger Games. 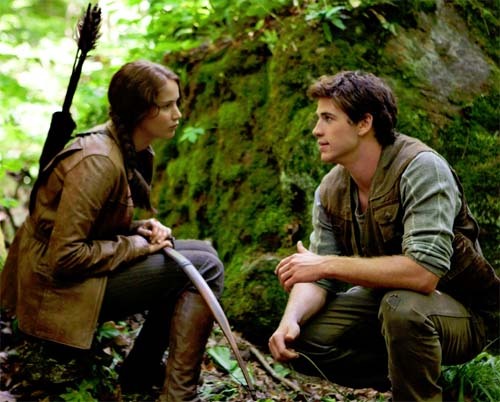 This film was based on Suzanne Collins’ YA series of novels – a kind of kiddie Rollerball where young adults are thrown into a fight to the death to keep the TV audiences amused in a far future post-apocalyptic America called Panem (which always makes me think of PanAm for some reason. Fly me…). Every year in the ruins of what was once North America, the evil Capitol of the nation of Panem forces each of its twelve districts to send a teenage boy and girl to compete in the Hunger Games. A twisted punishment for a past uprising and an ongoing government intimidation tactic, The Hunger Games are a nationally televised event in which “Tributes” must fight with one another until one survivor remains. Pitted against highly-trained Tributes who have prepared for these Games their entire lives, Katniss is forced to rely upon her sharp instincts as well as the mentorship of drunken former victor Haymitch Abernathy. If she’s ever to return home to District 12, Katniss must make impossible choices in the arena that weigh survival against humanity and life against love. THE HUNGER GAMES is directed by Gary Ross, and produced by Nina Jacobson’s Color Force in tandem with producer Jon Kilik. « Griff the Invisible… Australian superhero genius.